I’ve kicked off 2016 with a lot of reading, mostly fiction. (So far, Brooklyn by Colm Toibin, The Martian by Andy Weir and now Wild by Cheryl Strayed. It’s strictly coincidence I’m reading all books turned movies so far this year.) I love reading, but when reflecting back on 2015 I can only think of a single book that has really stuck with me: Essentialism by Greg McKeown. 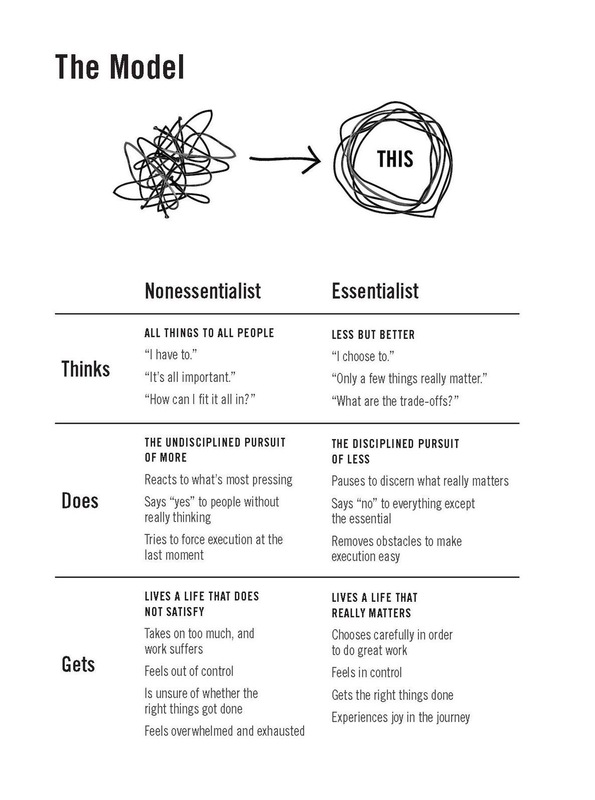 Essentialism takes a different approach to lifehacking. Rather than trying to eke more productivity of out each day, an essentialist intentionally chooses less. Fewer to-dos, fewer commitments. I’m an optimist by nature, and I can’t help but say “YES!” to nearly every juicy opportunity that comes my way. But McKeown advises being wildly protective over your time. Unless you feel like an opportunity is a 9/10, you should say no. It’s timely to reflect on this book at the end of January, just as my resolutions are feeling a little stale. Especially the diagram of going in a million directions versus one. When we have a lot of projects or too many priorities (a contradiction in itself), we fail to make meaningful progress on any one area. I kicked off 2016 with this ideal in mind. If I’m going to be bold and aim high, I am better off choosing one thing and applying steady focus. Next up in self-help/pseudo-business book reading is Deep Work by Cal Newport. I’m curious to see how well the ideas of Essentialism link to Deep Work. This year could lead to more singularly focused, deep working existence for me… Seems monk-like. I like it.